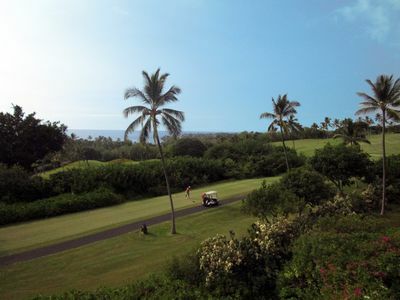 Whale season on the Big Island is between November and May. Humpback whales spend their winter months in the waters around the Hawaiian islands giving visitors and locals alike a chance to see these majestic animals in their natural habitat. People call it the Blue Lagoon home. 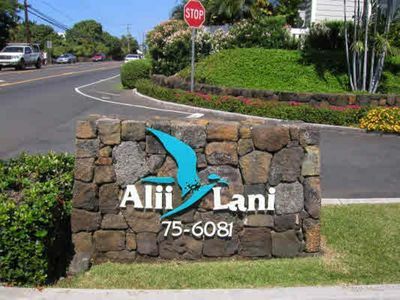 The official Hawaiian name for the home is "Hale 'Olu Olu", "The home of relaxation and comfort" which was recently given the name by Kahu Danny Akaka after a traditional Hawaiian house blessing was done for the home. 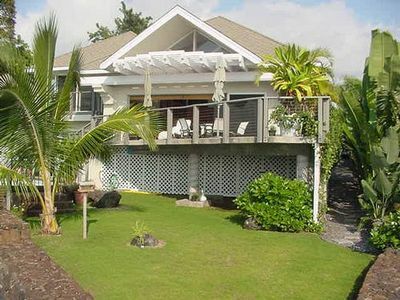 The home is considered a great Hawaii beach house with nice Hawaiian decor. Park the car and walk to the beach. 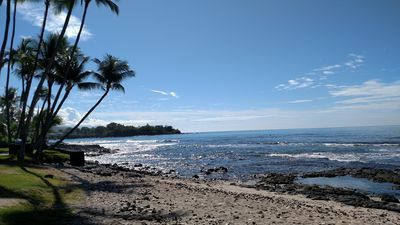 It’s a 5 minute walk to White Sands Beach (aka, Magic Sands Beach) and a 10 minute walk to Kahalu’u Beach Park, one of Kona’s premier snorkeling spots. 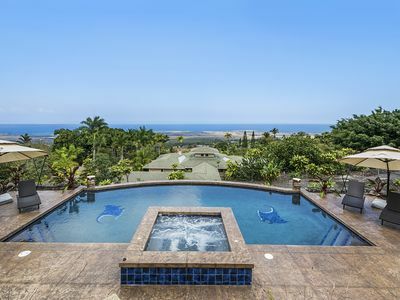 The Hale 'Olu Olu is a private home nestled in the quiet community of White Sands Estates. 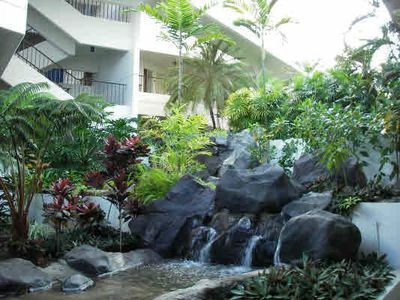 The home is built to feel as if you’re sleeping in the open tropical air and trees with detailed Hawaiian features throughout the home. The location is great for both the active person or just to sit and relax. 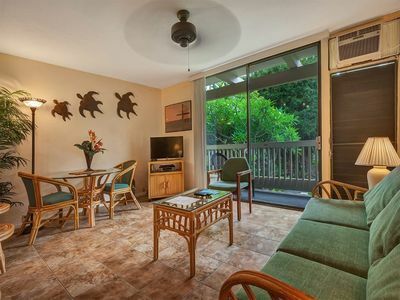 After a day at the beach enjoy the sunset view from the Lanai and the living room or wash off the sand and jump in the private blue lagoon like salt water pool. 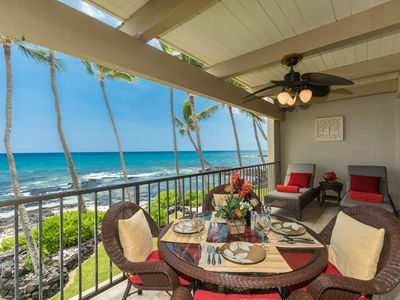 This family friendly Hawaiian beach house is a great hub for birthdays, anniversaries, holidays, wedding get together and don't forget the annual Ironman world championship. 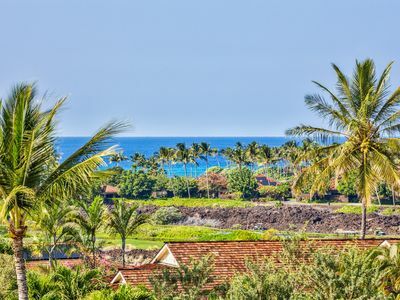 The property is dotted with palms, fruit and plumeria trees. 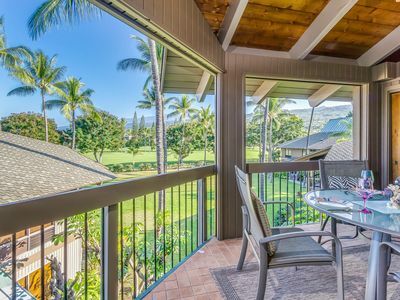 The home sits in a friendly and normally quiet cul-de-sac in a friendly Kona neighborhood. 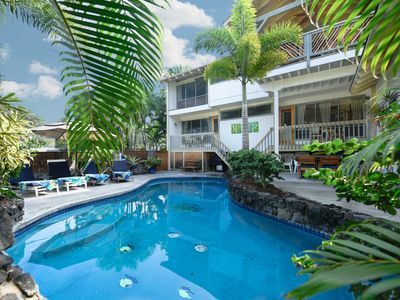 The Hale 'Olu Olu is a large two story home. 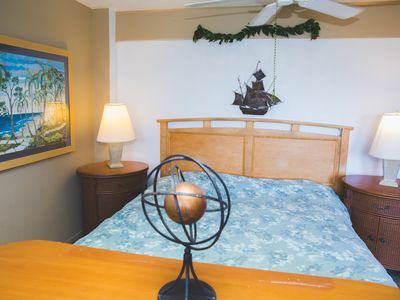 All bedrooms have its own private bath and entryway along with a private lanai. 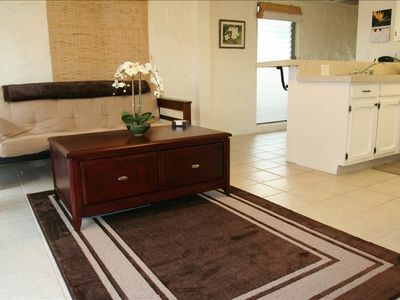 All the downstairs rooms have an upgraded feature of a wet bar for added convenience. The home has a separate stand-alone unit for additional privacy. Hale 'Olu Olu is great for birthdays, anniversaries and wedding get together's. *Upstairs: Master bedroom with a queen and second family room set up to be used as a semi private bedroom with a baja couch (two twin beds), Hawaiian armoire and office nook. 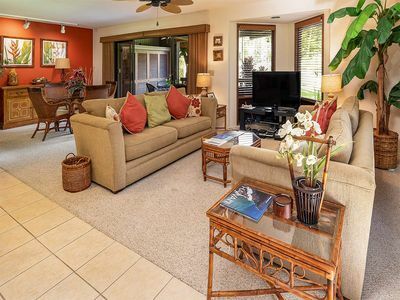 Downstairs has a bedroom with a queen, wet bar and private bath and lanai. A second and third bedrooms consist of two twins (covert-able to kings) each with its own bath, private lanai and wet bar. The separate unit consists of a queen, private bath and kitchenette. 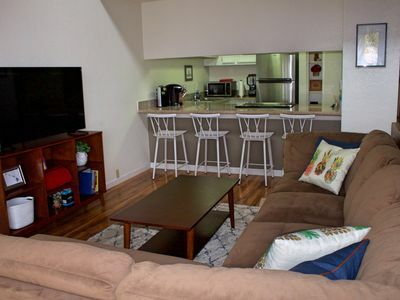 All bedrooms have a TV and wet bar. 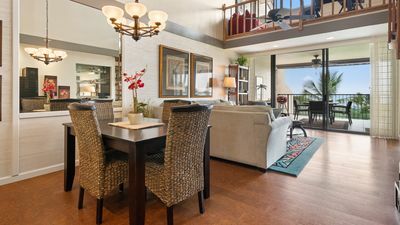 The beach home also comes with a full laundry facility, wireless and patio table for eight and an extra BBQ in the patio area. We also have two Pak-n-Plays, high chair and three fold-aways for extra sleeping accommodations. Other amenities include beach equipment, boogie boards, snorkel gear and three strand cruisers (bikes). Amenities near by are White Sand Beach (aka, Magic Sands, aka La'aloa Beach) 5 minute walk, Khalu'u Bay a 10 minute walk for snorkeling, Kona Village 20 minute bike ride or 10 minute car ride, KTA Shopping center a 4-5 minute drive and the birth place of King Kamehameha III and all the associated historical reference just to name a few. Water sports is extremely big on the Big Island. 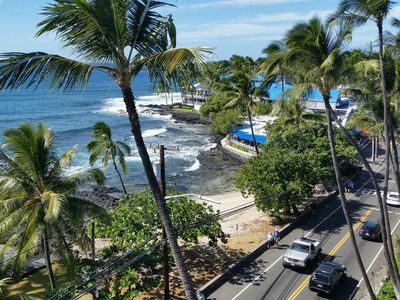 Banyans, a world famous surf spot is on a 2-3 minute drive located at the 2 mile marker along Ali'i drive, Snorkeling can be done just about anywhere along the coast when its calm, usually in the morning hours. There are many launch points for paddle boarding and kayaking. Surf lessons can be conveniently taken at Kahalu'u Bay through Kahalu'u Bay Surf and Sea which is just a short distance from the Hale. 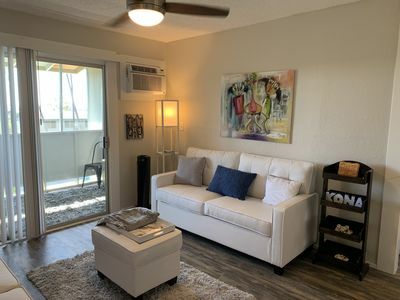 Some recent updates to the home include a new washer and dryer, new refrigerator, range, dishwasher, microwave, cushion covers, tiled lanais, O'hana lanai and new fans throughout the home. Daily price of $449 is the quiet season price. Prices and minimum stay vary depending on time of year. First two weeks of October - $795 a night. Minimum stay of 10 days. Mid December to the end of March - $695 a night. Minimum stay of 7 nights. No matter the pricing always make an inquiry in case were running a special! 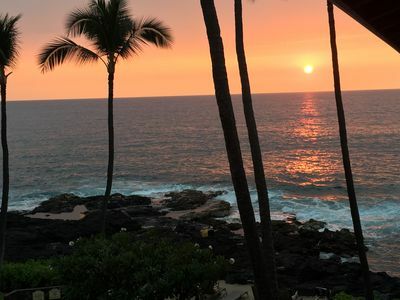 TOTAL DAILY RATES DO NOT INCLUDE THE STATE OF HAWAII TAX RATE OF 14.42% (GET 4.16 and TAT 10.25%) State of Hawaii implemented new tax rates for 2018. Tax ID's: TA - 178-151-0144-01 & GE - 178-151-0144-01 as of 10/27/2016. 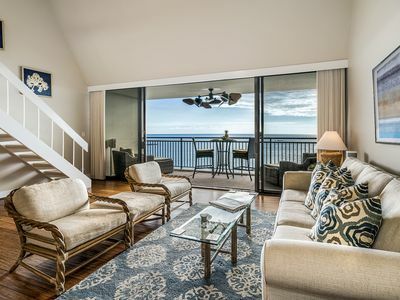 Spectacular Oceanfront Fully Remodeled Condo! 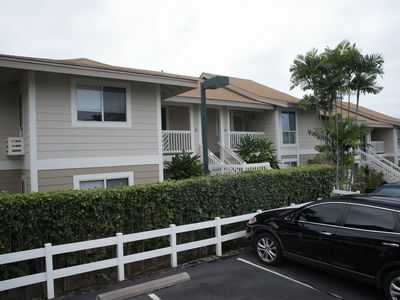 Private Condo Across the Street from the Beach!! Discounts offered! !